Fall is the season of turning inward, of slowing down, and of establishing new routines. As we round the corner to our tenth year in business, we are excited to offer you a new Yoga pass option to support your Yoga habits! Hemma means home, and over the last decade of welcoming you for Yoga and Acupuncture, many of you have truly made Hemma your home away from home. (We love this!) 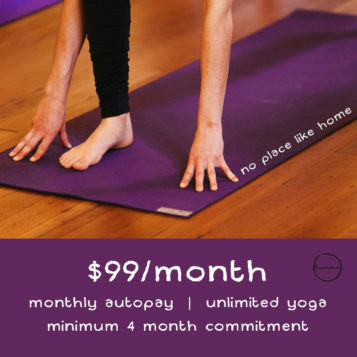 For our Yoga students who spend a lot of time here, the new no-place-like-home membership is $99/month and offers you unlimited access to our 35+ classes per week. This pass requires an initial 4 month commitment and since you are charged automatically each month, you don’t have to worry about topping up your pass. If you’ve been wanting to get back to the mat, purchase your pass online and we’ll see you soon!